Captain Hook is a bad guy. Peter Pan is a good guy. This is what we know, whether our education comes from Disney’s beloved Peter Pan of 1953; 1991’s Hook, in which the title character is played with dastardly relish by Dustin Hoffman; or J. M. Barrie’s plays and novels of the early 20th century, in which the character of Peter Pan was created. Regardless of the origin of our knowledge, this is what we all know. Or, should I say, that is what we knew. 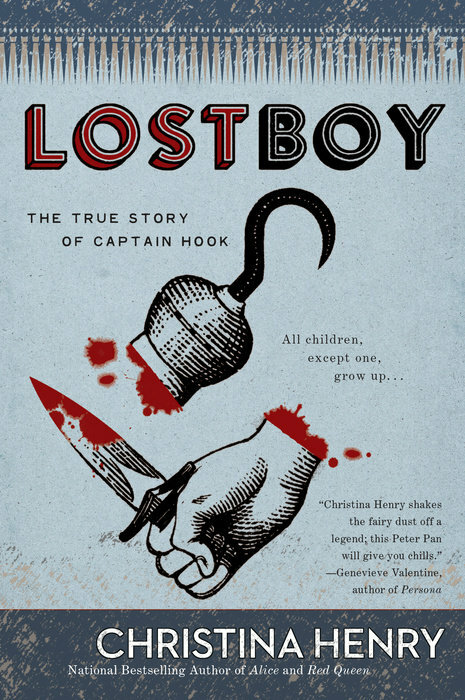 Christina Henry’s novel Lost Boy: The True Story of Captain Hook turns that basic knowledge on its head in the most compelling and darkly delightful way. Who were the Lost Boys, the boys that were already established in Peter’s Neverland before he brought Wendy, John, and Michael Darling to visit? How did they get there, how did they live, and why don’t they ever grow up? Henry takes on these questions and more as she weaves a tale of darkness and suspense in which the reader both knows the outcome and also cannot possibly know the outcome, drawing out the anticipation right up until the very last page. Though Lost Boy shares a setting with a beloved children’s classic, one thing should be made abundantly clear: this is not a children’s novel. It is, in fact, a psychological thriller, horror story, and fantasy tale that digs deep into the nature of Neverland, a wild and often terrifying island where the established rules of life and death are turned on their heads and the dominant personality is that of a little boy who refuses to grow up and is unable to experience love. Just describing it in that way will make many readers wonder how they ever could have missed what Henry’s novel makes so obvious: Neverland is a dark place where dark things happen to people. Lost Boy is not the first time that Christina Henry has put a dark spin on a children’s classic. In her Chronicles of Alice series—which has two installments so far, Alice and Red Queen—Alice’s adventures in Wonderland get a similar gritty treatment. However, the author’s current endeavor features an exploration of an established literary villain that forays into a world previously dominated by Gregory Maguire, who has written many such novels (most notably Wicked: The Life and Times of the Wicked Witch of the West, the basis for the Broadway musical). But where Maguire’s story lines sometimes meander and become mired in political minutiae, Lost Boy is focused and action driven while simultaneously delving deep into the sometimes painful realizations that accompany a boy’s unwilling maturity into adulthood. Henry’s island of Neverland and boasts most of the features that readers will remember from other versions of the Peter Pan story; the pirates, the mermaids, and even the Lost Boys’ tree are all there. One notable absence, however, is the culturally problematic tribe of “Red Indians,” a feature of the original Peter Pan story that is full of deeply racist stereotypes. They are thankfully replaced with a much more universally acceptable enemy: giant, many-legged, bloodthirsty creatures that are never quite identified as giant spiders, though that is certainly where my imagination took me (to my somewhat shivering and delicious horror). We experience the world through the eyes of Jamie, Peter Pan’s first and favorite companion in Neverland and the self-proclaimed protector of the Lost Boys. While Peter starts fights with pirates and takes the boys on dangerous adventures, it’s Jamie who makes sure they are fed and taken care of as best he can, considering Peter’s love for violent play. As the novel unfolds and Peter spirals further out of control, Jamie attempts to mitigate the dangers the situation, ultimately facing down Peter in a final confrontation that leads to a transformation into Captain Hook. Though that may sound like a major spoiler, it’s not—the reader knows from the beginning (from the title page, even) how Jamie’s story will ultimately lead into the events of the Peter Pan mythology. But Christina Henry keeps readers guessing about other facets of the story by weaving other vibrant personalities into the world she’s imagined. She uses these personalities to maintain the sense of mystery as the reader cannot be sure of the fate of these other endearing characters once the story has concluded. Indeed, she manages to keep up the suspense right up until the last chapter, with twists and turns that kept this reader glued to the pages. One thing I can promise: once you experience Lost Boy, you will never view the singing, flying, happy-go-lucky Peter Pan of stage and screen in the quite the same way ever again.